The WiMAX ForumTM will change the Broadband Wireless market forever. Interoperable Broadband Wireless equipment has long been the dream of service providers, and with the advent of a bespoke standard like 802.16 this dream is fast becoming a reality. By the end of 2004, Airspan Networks, along with its fellow WiMAX members, will introduce equipment with true interoperability. Service Provides will be able to purchase CPEs from one vendor and Base Stations from another. This interoperable baseline will enable new applications, some of which are highlighted in this paper. At the heart of any WiMAX CertifiedTM product is a sophisticated 256 tone Orthogonal Frequency Division Multiplexing (OFDM) based radio. Perhaps the most important characteristic of 256 OFDM is it’s ability to cope with difficult radio environments, and in particular Non Line-of-Sight (NLOS) deployment situations. This special property allows WiMAX equipment to be deployed in virtually every location, including indoors. The appetite for broadband services is growing and it is fast becoming a "utility" service for businesses and consumers. Wireless delivery of broadband services offers a new level of flexibility and ‘go anywhere’ connectivity. To address this need we foresee a range of different applications for WiMAX products, which will initially include high end services to businesses and corporate customers, products which deliver DSL-like services via wireless, and backhaul for 802.11 Wi-Fi hotspots. By 2007 we expect this to expand to also include the first truly "Personal Broadband" services, where WiMAX will deliver real broadband at speeds between 2 and 10 Mbit/s in almost any location, indoors or outdoors, at home or at work, at rest or on the move. 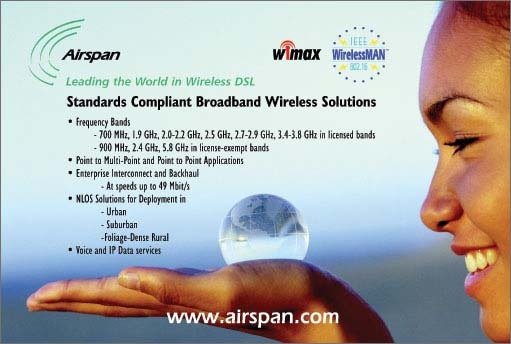 Late in 2003 Airspan introduced it’s first full 256 OFDM 802.16a compliant product. Called AS4030, this high-end product delivers throughput speeds between 9-36Mbit/s, with or without simultaneous E1/T1 transport. This product enables service providers to instantly see the benefits of 802.16a NLOS capabilities and for the very first time deploy networks for the backhaul of Cell Sites using NLOS techniques, something that has not been possible before. Traditionally backhaul for Cell sites has used conventional Point-to-Point Microwave links. These links were engineered on the basis of full radio Line-of-Sight (LOS) between the towers to ensure that they are reliable and delivered good bit error rates. AS4030 changes the rules and allows cell site operators to deploy E1, T1 or IP services in situations without LOS. The benefits are many. Micro and Pico cells, which are typically deployed in tactical locations to fix capacity and coverage holes can now be served with wireless 802.16a backhaul products, rather than copper or fiber which traditionally is only provided by the incumbent ILEC. Third Generation Mobile systems, which require IP plus E1 or T1 backhaul can now be served by Point-to-Multipoint (P-MP) backhaul systems, like AS4030. The P-MP backhaul can share capacity between sites, trading capacity between lightly loaded cells and the cell sites that are busiest. The effect is a significant reduction in the cost of backhaul provision and an improvement in cell site economics. AS4030 can also be used in Corporate or Business Applications. Each AS4030 CPE has IP and E1/T1 interfaces. This enables the simultaneous provision of E1/T1 for voice applications, like the provision of Primary ISDN for PABXs, and the delivery of very fast IP services (to 30 Mbit/s). By allowing service providers to simultaneously support two streams of revenue, from leased line E1/T1 circuits carrying voice and high bandwidth IP, the business case improves dramatically. Add to this the ability to connect customers in NLOS locations, and you have an “LMDS-like” business case that works in the real world. Less than 6 months after the AS4030 was launched, Airspan Networks has 802.16a 256 OFDM networks in Australia, Russia and Serbia. Service Providers have instantly recognised the advantages of 802.16a 256 OFDM technology and the superior economics that accompanies them. Airspan Networks, and it’s fellow Forum members, will participate in Interoperability testing called plugfests, at the end of 2004 and early 2005. This testing will bring to market the first fully interoperable WiMAX CertifiedTM products. Based on the updated 802.16a revD standard, these products will be available in the 2.5 and 3.5 GHz licensed bands, and the 5.7-5.8 GHz unlicensed band. This next wave of products will include WiMAX’s first fully interoperable CPEs based on Merchant 802.16 silicon from vendors like Intel, Airspan Network’s silicon partner. These new 802.16d based CPEs will enable a new range of applications, specifically WiMAX based "Wireless DSL". "Wireless DSL" is defined as the application that can deliver a DSL-like services using broadband wireless. Airspan Networks products in this space are targeted at enabling Wireless DSL applications at speeds of up to 10Mbit/s in licensed spectrum and 20Mbit/s in license-exempt bands. WiMAX Wireless DSL will fully compete with "wired" alternatives, meeting and matching the peak speeds available on traditional DSL, even in places like Japan where 8 and 12 Mbit/s DSL services are commonplace. WiMAX’s Wireless DSL products will come in two varieties. Initially products will be similar to today’s proprietary systems (like Airspan’s ASWipLL and AS4020). CPE Equipment will consist of an outdoor unit (typically an integral antenna and radio unit) and an indoor unit, which contains the service interfaces. WiMAX’s NLOS capability will support flexible deployment in complete NLOS conditions whilst still achieving very high radio throughputs. During 2005, a second type of WiMAX CPE will become available. New "indoor" CPEs will enable customers to self-install reducing the installation cost to service providers and improving the overall economics. Indoor CPEs will also be significantly cheaper than outdoor variants, again improving the business case for service providers. CPEs will be supported by two broad classes of Base Station. Pico or Access Point like Base Stations will be used for creating 5.8 GHz unlicensed deployments (typically in rural or Enterprise applications.) In licensed spectrum these smaller Base Stations will be used for filling capacity hotspots and coverage holes. Larger, more sophisticated Macro-layer Base Stations in licensed spectrum will provide 100Mbit/s plus capacities, and aggressive frequency re-use by the application of sophisticated Smart Antenna technologies (supported within the 802.16a revD standard and WiMAX System Profiles). Two-tier radio networks, consisting of both Macro and Pico layer Base Stations will enable service providers to focus capacity and coverage for the delivery of ubiquitous wireless broadband (both indoors and outdoors). Another key application for 2005 will be the deployment of networks based on combinations of WiMAX and Wi-Fi (IEEE 802.11). WiMAX and Wi-Fi will be deployed together in many ways. WiMAX will be used extensively for backhauling Wi-Fi hotspots. Clusters of bridged Wi-Fi Access Points deployed in Hotels, Shopping Maul’s and Airport complexes will be backhauled by high capacity WiMAX CPEs. The business case for Wi-Fi Hotspot networks will radically change as service providers are given an alternative backhaul that avoids the expense associated with the rented high speed leased lines. Wi-Fi and WiMAX will also be combined in Residential and Business locations. WiMAX will provide fast IP pipes for local distribution inside buildings using Wi-Fi. Wi-Fi, which is increasingly being integrated into consumer electronics, and household appliances will connect to the wide area using WiMAX, providing a seamless wireless paradigm shift away from cabled networks. IEEE’s 802.16 team is not stopping after 802.16a revD is completed. 802.16e is a further enhancement of the standard which will bring with it new functionality to enable portable, nomadic, even mobile-like service propositions. A new power saving "sleep-mode" will enable battery backed CPEs. Modifications to the 256 OFDM will enable connectivity at speeds of up to 125 km/hr. This will, for the first time, deliver 2-10 Mbit/s services to users across the wide-area with portable CPEs in a mobile context. User adoption for this type of service offering will be swift, as suddenly the user experience from "Wi-Fi" hotspots becomes pervasively available across a WiMAX service provider’s wide-area footprint. In addition, WiMAX’s low latency wireless broadband capability also brings dramatic new possibilities for supporting other services, like Voice, Video and Gaming. Voice payloads of a few kbit/s will be easily supportable alongside Multi-megabit data speeds. New "on-demand" video services will stimulate the usage models and undoubtedly drive new functionality, like two-way video capabilities into Laptops and PDAs. WiMAX’s interoperability and standardization of Broadband Wireless will create a full "eco-system" of silicon vendors, radio providers, equipment manufacturers, system integrators, network management solution providers, radio planning and network design consultancies. This eco-system will deliver economies of scale that are impossible with proprietary solutions. The unstoppable “cost-reduction” will then enable the integration of WiMAX functionality directly into end-user devices, which by 2007 will already incorporate baseline Wi-Fi connectivity for high-speed local area connectivity. The result will be "Personal Broadband". A situation where all of the common end-user devices (laptops, PDAs, video consoles etc...) have access to ‘always-on’ multi-megabit broadband connectivity; Where devices seamlessly roam between Wi-Fi networks in the home or the office, to wide area WiMAX networks deployed across whole cities, or urban conurbations. Airspan Networks, along with over 70 other member companies within WiMAX, share a common vision of Next Generation Broadband Wireless networks. Airspan Networks, a leader in the Broadband Wireless Market today, is actively developing products and services to turn this vision into reality. WiMAX, "WiMAX ForumTM" and "WiMAX CERTIFIEDTM" are trademarks of the WiMAX Forum.